News reports of large-scale data breaches have prompted many questions on what to do to protect yourself. Check your credit reports for free every few months by visiting AnnualCreditReport.com or calling 1-877-322-8228. Federal law allows you to get a free copy every 12 months from each of the three nationwide credit bureaus, Equifax, Experian, and TransUnion. Accounts on your credit report that you don't recognize could indicate identity theft. Visit ftc.gov/idtheft to find out what to do. Ask the credit bureaus to place a credit/security freeze on your account which will let you limit access to your credit report, and will make it more difficult for identity thieves to open new accounts in your name. One thing to remember: A credit freeze doesn't prevent a thief from making charges to your existing accounts. Even if you elect a credit freeze you still will monitor your existing credit card and bank accounts for charges you don't recognize and report them to your bank. Finally, be aware of phishing scams. Delete email or text messages that ask you to confirm or provide personal information (credit card and bank account numbers, Social Security numbers, passwords, etc.). The sender already may have some personal information about you, stolen as part of a data breach. Don't let that fool you. Legitimate companies don't ask for sensitive personal data via email or text. Your identity is one of the most valuable things you own. It's important to keep your identity from being stolen by someone who can potentially harm your good name and financial well-being. Identity theft occurs when someone uses your name, address, Social Security Number, credit card or financial account numbers, passwords, and other personal information without your knowledge to commit fraud or other crimes. Phishing is an email scam used to steal your personal information. Email may appear in your inbox, claiming to be from your financial institution, credit card company, or another source. It may appear authentic but be careful - any email requesting personal information or to "verify" account information is usually a scam. Do not respond to this and do not click on any link from this email. The Internet is a great place to browse and do business. 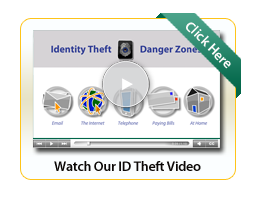 But it can also be a Danger Zone for identity theft if you don't know what to watch for or how to protect yourself. Learn how to practice safe browsing. Watch out for public Wi-Fi. Public connections aren't very secure, so don't perform banking transactions on a public network. Use caution when downloading apps. Apps can contain malicious software and viruses. Beware of apps that ask for unnecessary "permissions." Avoid storing sensitive information like passwords or a social security number. Beware of mobile phishing. Avoid opening links and attachments in emails and texts, especially from senders you don't know. And be wary of ads (not from your security provider) claiming that your device is infected. Wipe your mobile device before you donate, sell or trade it. Be aware of shoulder surfers. The most basic form of information theft is observation. Be aware of your surroundings. Protect your phone from viruses and malware just like you do for your computer by installing mobile security software. The telephone is one of the most often used sources for criminal activity. Here's how it works. Your phone rings. The caller claims to be from your financial institution, or any other source. They begin asking questions about you and your account. This could be a telephone scam called Vishing. Someone is attempting to steal your identity. And it happens to millions of Americans every year. Payment fraud happens when someone uses information from your checks, credit and debit cards, or any other form of payment without your knowledge to commit fraud or other crimes. But this and other forms of identity theft can be avoided, if you know how to protect yourself. The simple act of sending and receiving mail and putting your trash out at night can put your personal information at risk. Financial information, checks, bank account and credit card statements, and monthly bills can be stolen from your home, mailbox or even from your trash, and used to access your accounts and steal your identity. If you're a victim of identity theft, what should you do? If your identity has been stolen, you need to take immediate action to limit the damage and protect your good name.